Our February update features some new (to us that is) examples of Buchschmid and Gretaux wood inlay work which, we are pleased to say, we have never seen before. Read on to find out what these pieces are. Our February update brings you some fine examples of Buchschmid and Gretaux wood inlay work which contains some pieces we have never seen before. We start with some Buchschmid and Gretaux pieces owned by Anna Waclawiczek of the USA which includes the first examples of Buchschmid and Gretaux Book Ends. These appear to be in very fine condition and one of the subjects depicted is well known to us, and indeed is featured lower down on this very page in its framed picture form. 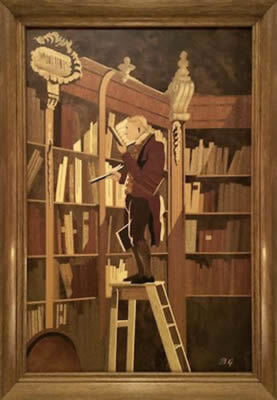 The subject, or title of the piece in question, is none other than the well liked "Bookworm" - and very fine it looks as a book end. The other book end could be a version of the title "Mind Over Matter" but that is only an estimate or a guess on our part. If anyone knows the correct title could they let us know as well please? Thanks. But all in all, these are very pleasing B & G pieces to see. 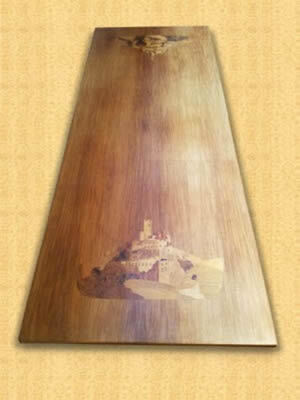 The next example of rarely seen Buchschmid and Gretaux wood inlay work is one of their rectangular tables. These rectangular tables don't appear very often, certainly nowhere near as often as the coffee tables, and those coffee tables are not what you could call abundant. 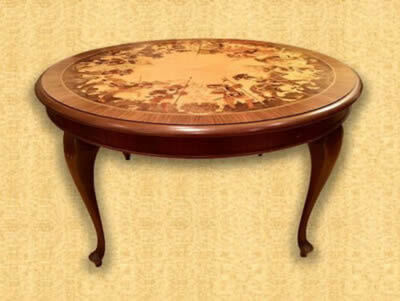 Once again we do not recognise the inlaid design on this table, it is not one of the "regular" (if you can call such rare pieces regular) designs, so we have to check our reference listings to find an appropriate title which we have not been able to assign before. So it's another "educated guess" on our part, but we think it could be "Flowered Boughs" - that is a design we have not seen before, but it could be completely wrong, so it you know, please do tell us, thanks. To be honest, the design looks like it could be "St. Michael's Mount" rather than anything flowered, but that subject does not turn up in our Buchschmid and Gretaux listings - so perhaps it could be a commission piece? Whatever, it is a rather nice table to say the least. 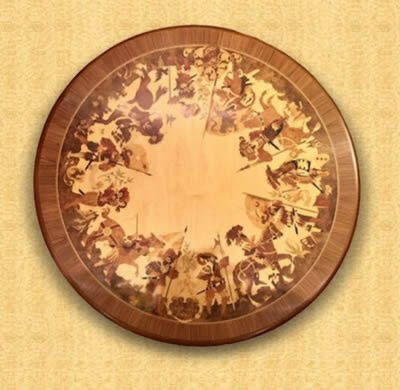 And talking of nice examples of Buchscmid and Gretaux wood inlay tables, our next example, this time owned by Suzanne Fox, is a most splendid round table depicting "The History of the World 1497 - 1792". Not only do we have a wonderfully detailed piece of marquetry or wood inlay work showing nearly three hundred years of medieval history on the table top itself, it also has a lovely example of veneer cross banding all around the edge of the pictorial design and the table's outer border. Veneer cross banding is a very pleasing effect which enhances everything it is used on. But cross banding in a circular fashion, such as seen on this table, is a tricky technique to get right. If it isn't done with care, the angles of the grain can create a very irregular appearance on the piece in question. 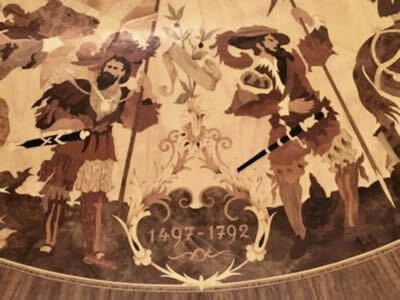 Happily, Buchschmid and Gretaux were craftsmen and wood inlay artists of the first order and always got this sort of thing right, as you can see in these photos. One important thing to note here is that there are no visible signs of varnish cracking or veneers lifting. Such problems usually come about from the effects of central heating or hanging or placing the wood inlay pieces in direct sunlight. Another problem with direct sunlight is the bleaching of veneers. It is the ultra violet in the sunlight which is the culprit here. But getting back to varnish cracking, it is central heating which, being a dry heat, causes the wood in the pictures, or tables etc, to lose its moisture content and dry out and shrink. 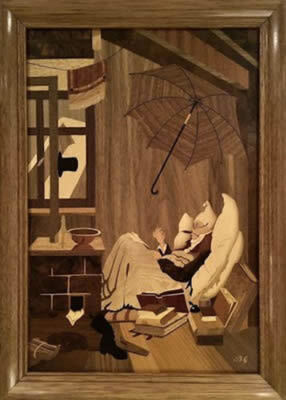 The rate of shrinkage is far greater than any which could affect the varnish, and thereby the unequal stresses mean that something has to give. In this instance it is the varnish which gives up first. The pull of the shrunken wood underneath the varnish cause the varnish to craze as it tries to battle against the inward pull of the wood substrate. 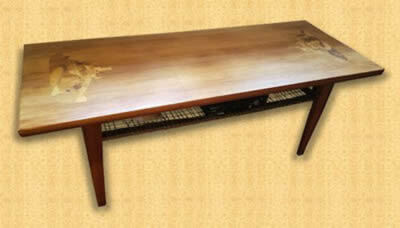 Hence the cracking pattern which affects varnished wood inlay works in centrally heated locations. The remedy to this sort of problem is to place small containers of water in the vicinity of the wood inlay pieces. The moisture given off naturally by the water is sufficient to rehydrate the wood inlay piece. It doesn't need any more treatment than that. Unfortunately if the piece in question is already suffering with cracked varnish, it's too late, so leave it as it is - don't apply water directly, it will make things worse. 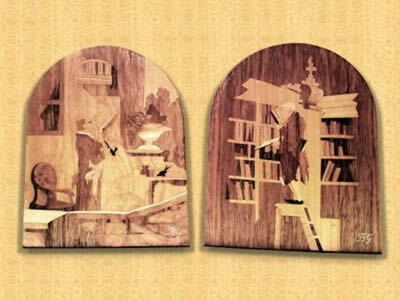 Just enjoy your wood inlay pieces as you would with any work of art. Time and enviroment all have an effect on organic pieces like these, so such effects are natural and they are all charming in their way and deserve cherishing, as our examples here have been cherished by their respective owners..
Click the above button to return to page 69 of "Can You Help"